What's wrong with the proposed redevelopment of Twerton Park? Re: What's wrong with the proposed redevelopment of Twerton Park? Thanks for your comment LB. As I said in my previous post, In July, I will be informing the community en masse about the problems with the redevelopment. I'm going to use your quote above as an example of some of the attitudes I encountered from the fans. My views on the redevelopment seemingly aren't too dissimilar at all to yours Joe, but you'll lose people like me saying things like that. I was in the middle of posting that point about one view being portrayed as more, but changed my mind. I'm staying out of it as I'm a student with his final assignment due today so can't afford to be distracted. Listen: I'm fuming about this. There's a redevelopment process that's so far been walking over the Twerton community. And a bunch of dismissive, sarcastic and even scornful comments from fans on here. I've a mind to expose both. I'm being serious, I'll try and add more thoughts later on. Admittedly I'm not as qualified to discuss as others but I'll give it a go. If you read through my previous posts you'll see I try and be light-hearted, that's all. As a student myself (I don't live in student housing, if that's relevant) I was quite offended by some of the comments, particularly the addition to the poll when 'yes' and 'no' was all that was needed. I see. Well I was a student for seven years doing a degree and then a '1+3 award'. I also had student lodgers for three years. We aren't 'anti-student' in the sense that we think students smell of wee or something. The protestors want balanced communities, where the needs of different social groups like families and the elderly are properly included in the remaining developable land around Bath. As you probably know, there's a tendency for developers to opt for student accommodation in order to cram the maximum number of people into a space and accrue the maximum number of rents. Then this can lead to small businesses being pushed out, existing tenants being replaced, and the needs of those on the housing list ignored. So those are the main factors underpinning concerns around the redevelopment re students. Because so much land has been given to student blocks lately, some residents aren't in favour of any more in Twerton going to that cause. But most are up for a compromise when you talk to them about the ins and outs of Twerton Park. I've tried to represent both views. The number of students has been increasing for some time and they need to live somewhere. They used to occupy houses which were better suited to house families. Building suitable student accommodation in blocks makes better use of space and allows the terraced housing to go to families who desperately need housing. 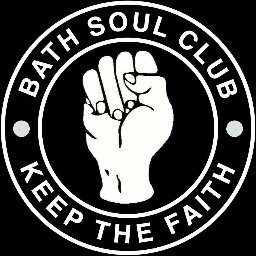 Bath City Football Club is a limited company, with a community majority shareholding, which needs to work for its own survival and to maintain its viability long into the future for the people of Bath. Building student accommodation will maximise the use of the limited site available, provide much needed housing for students, help free up houses for families and, as has been put before, bring a regeneration of the area with all the benefits that students will bring. Alternatively, is the football club merely to serve the needs of building low cost housing, which would not be a viable financial scheme for the club, or perhaps fully serve the community by building low cost housing all over the stadium site and pulling the plug on a famous old football club? Out of interest if the development where to switch to a more acceptable (to the protestors) student/social housing balance would the possible loss of the Magic Wok - which, as a fairly regular patron (though ironically normally after football) I'd be sad to see go - be less of an issue? yuffie wrote: Out of interest if the development where to switch to a more acceptable (to the protestors) student/social housing balance would the possible loss of the Magic Wok - which, as a fairly regular patron (though ironically normally after football) I'd be sad to see go - be less of an issue? From previous comments it sounds like the only acceptable proportion of student housing to the objectors would be zero. It would be good to have that clarified. Interesting question on the Magic Wok, which by dint of its location is likely to be part of ANY development of the stadium site - whether the overall scheme included students or otherwise. Even if the stadium plans didn't progress, there would still be a good chance Magic Wok would fall victim to whatever alternative plans its landlord came up with for that stretch of buildings and the strip of car park land behind it. It is likely that change is coming to Twerton High Street, whether it involves Bath City or not. And not before time IMO, as it is on its last legs and desperately needs revitalising and improving for the benefit of those who live and work there. The owners of the high street have the tenancy agreement with the shops, not the football club. Whether they can terminate that agreement depends on the lease conditions. If the Golden Wok has already been served notice I would suggest that the owners have plans independent of the re-development of Twerton Park. City 'til we're relegated wrote: The number of students has been increasing for some time and they need to live somewhere. They used to occupy houses which were better suited to house families. Building suitable student accommodation in blocks makes better use of space and allows the terraced housing to go to families who desperately need housing. I'm sorry, but this is another of those arguments we hear that doesn't work. A 10% limit on the number of houses that can be converted into student HMOs has been imposed in Bath. It means that great swathes of Bath like Oldfield Park are already out-of-bounds to student landlords. As a result, Twerton is now being targeted as an area to build student HMOs. Two more conversions to student HMOs in Twerton have been approved in the last fortnight. Twerton (and everywhere else) will fill up with its 10% of student HMOs irrespective of whether any more student blocks are built. As a matter of fact, much of Twerton already falls under the 'protection zone' where no more HMOs can be built. In short, building student blocks will have no long-term effect on the loss of family housing to HMOs. 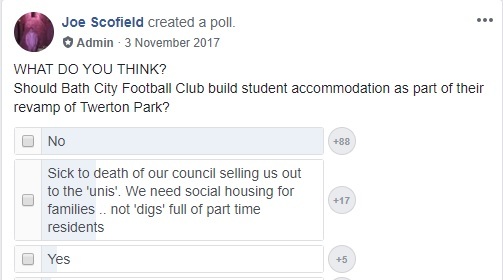 Alternatively, is the football club merely to serve the needs of building low cost housing, which would not be a viable financial scheme for the club, or perhaps fully serve the community by building low cost housing all over the stadium site and pulling the plug on a famous old football club? Alienating the surrounding community is a sure fire way of scuppering the football club my friend. A better compromise is obviously the way forward. BenE wrote: The owners of the high street have the tenancy agreement with the shops, not the football club. Whether they can terminate that agreement depends on the lease conditions. The lease conditions certainly won't be enough to save the Magic Wok. Although the lease has another two years on it, a clause states that the owners have to vacate if given notice to do so. Greenacre Capital's plans for the High Street are more likely to be approved by planners as part of the broad redevelopment put forward by the football club and Greenacre. The club does have some 'wiggle room' to negotiate. It may also be very profitable to relocate the Magic Wok to the Twerton Park complex. The takeaway does a good trade and would be popular with the new students, football fans, people attending the suggested live music venue, and so forth. In comparison, the proposed cafe would be unlikely to bring in a profit. SteveBradley wrote: From previous comments it sounds like the only acceptable proportion of student housing to the objectors would be zero. It would be good to have that clarified. I think most people are looking at compromise now. There's an evolution of thought that comes through discussion. Last Autumn, Twerton residents were fed up with ever more land being given to student accommodation. More and more family homes were getting converted into student HMOs; lots of land along the Lower Bristol Road had already been developed into student blocks; and there was news that the Mercy in Action warehouse could give way to student residences too. Further news that the Twerton Park football ground site was to be developed into student blocks was hardly popular. Residents were aware that the need for family housing, social housing and affordable housing, was being overlooked for the sake of bigger profits. The problem isn't with the character of students -- it's with the prioritisation of students. So, at the time, there were backlashes of bad feeling expressed on the Facebook group: Proud of Twerton Whiteway and Southdown, which I administer and which has almost a thousand members. There are still many residents who feel strongly against any more land in Twerton getting developed for students -- but most seem able to embrace compromise for the sake of saving the pitch from being sold and developed. Several of the protestors met with Bath City FC director Sally Harris on Saturday and everyone was in favour of compromise. The minutes of that meeting are recorded at: tinyurl.com/y7sj8vy5 . While I was finishing my studies at the University of Bath, I took part in the first protests against the £9000 per year tuition fees that future students would be hit with. The needs of students are important. A lot of students don't want to live in student blocks that are expensive and remote from campus. They have to pay out a lot in travelling expenses and sometimes turn up late for lectures due to the distance. Many students would prefer to live on campus. But the University of Bath knows that it can just go on building teaching blocks on-site and rely on developers to provide bed-space for students in places like Twerton. So there's another angle on things. I get the impression that Joe does not like Bath City, or perhaps football. Perhaps it does not bother him that the club are trying to secure their long term future, and if they were to fold, the whole site could then be used for housing. This might be his dream solution. Bath City are in a precarious position where they need a very good scheme to allow them to clear debts are fund their future. I struggle to see how this development would work anyway but, if it was diluted at all, the economics might just not add up. Joe Scofield wrote: Further news that the Twerton Park football ground site was to be developed into student blocks was hardly popular. If that was the way it was put to them I am not surprised it wasn't popular as it is incredibly misleading. Which also appears to be the case regarding the possible closure of the Magic Wok. Both the leaflet and the sign at the protest state that they face being chucked out to make room for more students. A very emotive claim when in fact the takeaway would have to make way for any form of redevelopment of the area. And it is telling that no mention is made that the option of the takeway being incorporated into the redevelopment has not been ruled out. I can't open the link to the minutes of the meeting you had with Sally Harris. Please can you share them in a different format. comrade powell wrote: I can't open the link to the minutes of the meeting you had with Sally Harris. Please can you share them in a different format. The link is here: tinyurl.com/y7sj8vy5 (also fixed in the original post). This assertion assumes that things stay the same. I lived in Twerton when I was a student and I was the only one. No other student came anywhere near. There are a few peppered about nowadays. However as the restriction on HMOs takes hold then student properties will naturally spread across the whole city and hence into Twerton. This will happen whether there is student accommodation at Twerton Park or not. Surprisingly students do tend to gravitate to cafe's. Witness the Velo Lounge in Moreland Road. So as the demographics of the area changes so will tastes. City 'til we're relegated wrote: I get the impression that Joe does not like Bath City, or perhaps football. Perhaps it does not bother him that the club are trying to secure their long term future, and if they were to fold, the whole site could then be used for housing. This might be his dream solution. Sigh - another ad hominem argument. If you had taken a moment to read the minutes of the meeting I made available, you would know that none of us wanted to see the football pitch sold and redeveloped. Different people might give you different reasons why. For me, it's because I class the pitch as a green space -- and I don't believe Twerton's remaining green spaces should be concreted over to provide the miniscule bit of social/affordable housing that would be built alongside whatever else gets put there. City 'til we're relegated wrote: Bath City are in a precarious position where they need a very good scheme to allow them to clear debts are fund their future. I struggle to see how this development would work anyway but, if it was diluted at all, the economics might just not add up. For a start, the current proposals I've seen would most likely be chucked by planners anyway. Too much height, overdevelopment of land, mass parking issues etc. I've even heard a couple of your own directors admit that much. But a community can't allow the planning department to be its only safety net, hence the protest. I have previously commented that this plan should be seen as work in progress; there are issues with the extent of the development. The development is important to the club but more importantly must be acceptable to the local community and benefit the wider Twerton. BenE wrote: This assertion assumes that things stay the same. I lived in Twerton when I was a student and I was the only one. No other student came anywhere near. There are a few peppered about nowadays. Agreed. Let's aim more for balanced communities. A preponderance of student blocks rips off the communities that have to accommodate all these tall blocks, rips off the poor on the housing list who need more provision for them, and rips off those students who would like to reduce their level of student debt by living on campus (if more accommodation was provided for them there). Stop nit-picking over semantics. Residents realised that student blocks would be constructed at Twerton Park -- they got that from the Bath Chronicle, not me. As for the Magic Wok, the Chinese couple received no advice that they could be incorporated into the wider redevelopment at all. I don't think anyone from the football club board ever bothered to speak to them, let alone check how they might be affected by the joint development. They've been so frightened -- and the heart of the Twerton community goes out to them. The football club reminds me of someone who lights a massive bonfire and doesn't think that the smoke will spoil their neighbour's washing on the line next door. Nor is it a 'foregone' that the Magic Wok would be redeveloped in the future. It had been eleven years since Bayleigh Estates tried and failed with their application. And really, as if anyone could cram all the qualifiers you would like to see into a placard or A5 flyer. Propaganda isn't semantics. The Magic Wok is nothing to do with any proposed student blocks. You could accurately say that it is to make way for community space (within the outline proposals). But it is more to do with the redevelopment of the high street - which the football club has no control over. If the club said that closing the Magic Wok scuppers the whole deal, then the building owners could still choose to re-develop without the club or even just ask the tenants to leave, which they have done. As Ben points out it is not semantics. It is pointing out two statements that are at best vague and at worst deliberately misleading. Twerton Park is not being developed into student blocks. One part of the car park is, along with a number of other developments. The Magic Wok is not being chucked out to make room for more students. It's lease is being ended as part of a redevelopment of Twerton High Street. I assume the same is true of the bookies, McColls, etc. When the club is faced with this sort of approach I can understand why they may be reluctant to engage in discussions but hopefully the meeting with Sally is the beginning of a more constructive outlook from both sides. yuffie wrote: As Ben points out it is not semantics. It is pointing out two statements that are at best vague and at worst deliberately misleading. No. The concluding statement of the flyer calls on Bath City FC to come up with a fairer deal. This set the context of the flyer: that we wanted an alternative to the Magic Wok being removed - i.e. reinstated or relocated. Moreover, the flyer states that the Tangs face losing their business. To face something isn't the same as it being inevitable. So the possibility of coming up with other options in regard to the Magic Wok takeaway, is inherent in the wording of the flyer. yuffie wrote: Twerton Park is not being developed into student blocks. One part of the car park is, along with a number of other developments. Well you have a weak point, but only that. Nobody has made this claim except on a hastily typed post on here. yuffie wrote: The Magic Wok is not being chucked out to make room for more students. It's lease is being ended as part of a redevelopment of Twerton High Street. I assume the same is true of the bookies, McColls, etc. As we understand it, all the other retailers have had assurances that they are to remain. There's been some misinformation about the Magic Wok -- which springs from the marked lack of information made available. Considering the weightedness towards student accommodation, there's still an expectation that the site of the Magic Wok will consist of a retail unit with student flats above it -- and that this is the purpose of the demolition. I will personally guarantee you that any weakness in our text is either down to human error, or the pressures of having to produce something quickly. And you would do much better to challenge the semantics of the club itself. One just gets used to pulling out bits of misleading and wrong-footing phraseology in the consultations. Terms like: "a mix of accommodation types" and: "an element of student housing" make it seem like there's going to be a fair bit of social housing, with a smaller degree of student accommodation thrown in to increase profitability. In reality, it's the exact opposite of that: about ten times more space given to student accommodation. I hope there can be progress in the discussions. But you need to engage with the ways that the consultation has been far from transparent, before you start picking holes in discourse from the community that isn't word perfect. I've looked back over the thread to see where this concept of a lack of openness from Bath City came from. It is an assertion made by you half way through the thread and later repeated without any real foundation. You admit yourself there has been public consultation and that local people have attended. How does that not constitute public engagement? Isn't the purpose of consultation to find out how it will impact on the community? The proposals at the moment couldn't be more vague. Just blobs on a google plan. That is as far as they have got. Just how is the club supposed to inform neighbours of specific issues when they don't even know themselves? How many shop units are proposed? How many social housing units are proposed? How much car parking is proposed? How many student flats are proposed? How many trees? How then can you say whether any distribution is too much or too little? You can't, no one can. BenE wrote: I've looked back over the thread to see where this concept of a lack of openness from Bath City came from. It is an assertion made by you half way through the thread and later repeated without any real foundation. On the contrary, I think I've provided a reasonable foundation for my claim. 1) I demonstrated both verbally and graphically, that residents have been shown proposed five storey buildings, but it hasn't been made clear that these buildings would tower above the High Street. This point should have been made known. 2) Equally, I demonstrated that the same proposed scheme would build over most of the football club carpark; but it hasn't been made clear that this would lead to massive parking issues. That point should have been made known too. When the club isn't upfront about the pros and cons of its proposals, it isn't being transparent with residents. Then out of that, objections which residents would have made, don't carry through to the revised plans at the final consultation stage. Of course, we could add more. 3) Residents weren't informed at the April drop-ins, about the threatened loss of the Magic Wok takeaway and the sad implications for Mr and Mrs Tang. This would likely have caused a big outcry in Twerton. The board would argue that they couldn't give any details on this, as the Magic Wok belongs to Greenacre Capital and not them. But the club has been acting as the face of the joint redevelopment -- so the drop-ins shouldn't really have concealed this aspect either. They already knew that student blocks would be unpopular locally. At the open meeting, residents were treated to a pre-set question schedule. But the one key question that wasn't asked was: "How do you feel about student accommodation?" We all know what the reaction would have been. Unsurprisingly, about five months later, the unveiled proposals featured massed ranks of student accommodation. 5) I've also talked about how the language used is dubious. For example, the phrase: "an element of student housing" masks the fact that the proposed student accommodation dwarfs the amount of low rent housing. There's a list like this that goes on. It matters, because Twerton is a community which isn't all that adept at sounding out the problems with plans and proposals. BenE wrote: You admit yourself there has been public consultation and that local people have attended. How does that not constitute public engagement? Isn't the purpose of consultation to find out how it will impact on the community? You have a lot to learn. Public engagement is only listening when the relevant agency truly listens. Witness the controversy at Foxhill, where Curo went through many engagements with the local community, but then carried on with a deeply unpopular redevelopment scheme. They were going through the motions of listening, without really listening. That's what Councillor Goodman is trying to say in my newspaper article at: tinyurl.com/yc2eu225 . Now another thing. In an earlier post, you and someone else said that the flyer I produced was "propaganda". No it isn't. With the flyer, I tried to represent the main objections that residents had to the redevelopment of Twerton Park as proposed. I asked them about it first. If there's any mistake in the text, I will give an account of it here -- but it was accurate to the best of my knowledge at the time. So despite yours and 'Yuffie's' misleading claims, the flyer was about giving the community 'voice' and has nothing to do with "propaganda". Good evening. I'm a member of the football club's board which you are using this forum to attack. I'm not going to respond to your claims, partly as I'm presently abroad and therefore out of the loop and also because I feel that you should be raising your concerns with the relevant people at the club. It's good to learn that you have met with Sally Harris and I read your minutes with interest. However I'm concerned to learn from Sally that she had not seen them before you shared them with the world. I'm hoping to hear from her tomorrow that she is happy with the accuracy of what you have published.